Spokane – Today the H2KNOW campaign reminded the households and businesses in the Inland Northwest to conserve water to help the Spokane River. As daily temperatures rise, people and businesses are using more water, and Spokane River flows are dropping. The Inland Northwest is notable for its hot, dry summers. Water used by 600,000 people in the Spokane-Coeur d’Alene region comes from the Spokane-Rathdrum Aquifer, which also supplies the Spokane River. Water that would otherwise flow from the aquifer to the Spokane River is intercepted for human use contributing to low river flows. Low flows harm fish, wildlife, recreation opportunities, and businesses that benefit from the river. Large municipal wells that are close to the River, such as the City of Spokane’s Well Electric facility, can have an immediate depleting impact on river flows. Spokane River flows are monitored at the USGS Monroe Street Gage, a measuring device located just downstream of the Monroe Street bridge. Interested parties can watch flow trends on the web or in the local newspaper. 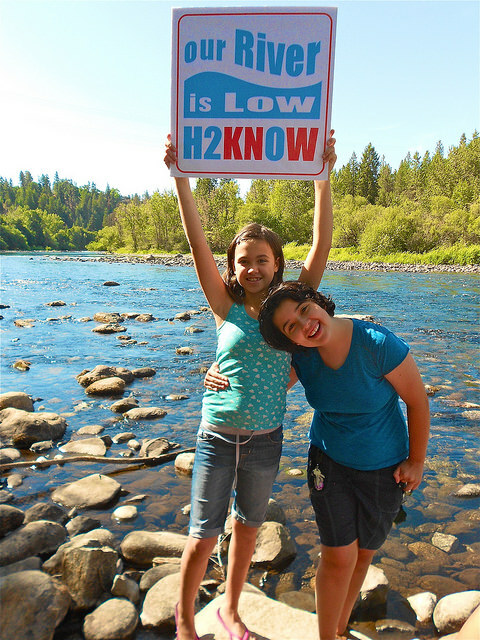 H2KNOW organizers note that, while the region is not yet suffering a repeat of last summer’s sustained high temperatures and lack of rainfall that caused high water consumption, high temperatures are in the forecast and will prompt increased water use, resulting in a decrease to Spokane River flows. The H2KNOW campaign is a community-based water conservation project hosted by the Center for Environmental Law & Policy and Sierra Club.